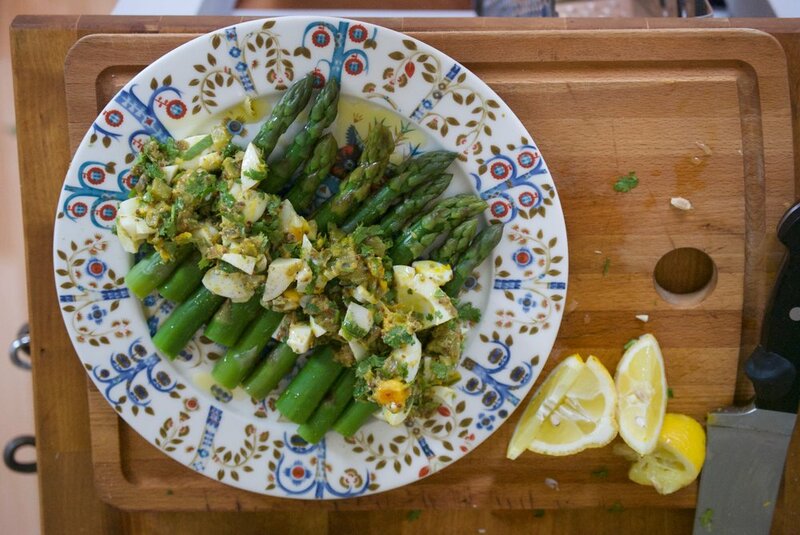 I had to get this post out before the middle of June, which is ostensibly the end of asparagus season. Asparagus, strawberries, peaches, cherries and figs all fall into the category of "things that should not be eaten outside their season, but are always available anyway." But listen, even if you do eat asparagus in February, that's cool, but eat a whole bunch of it right now, because those little stalks taste amazing right now. They taste so amazing in May and June that you don't really need to do much to make a great meal. 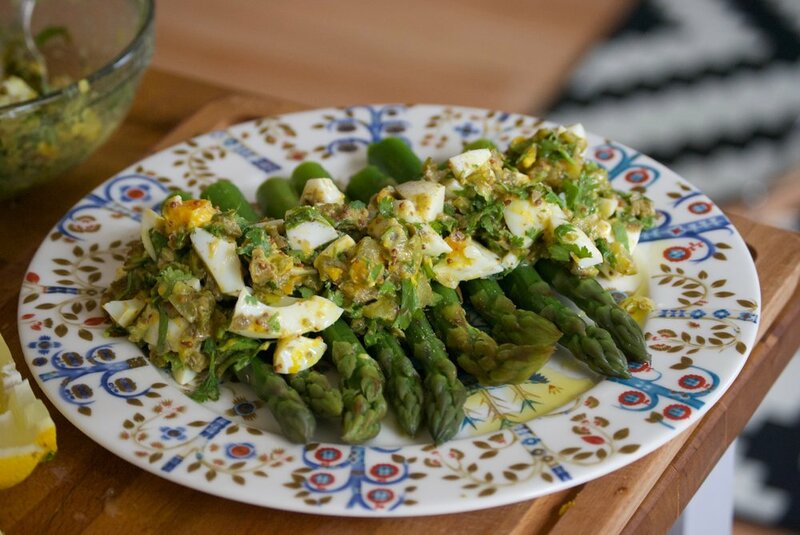 A sauté with garlic and squeeze of lemon or steamed and served with a light hollandaise are two of my favorite ways to each piles of asparagus. 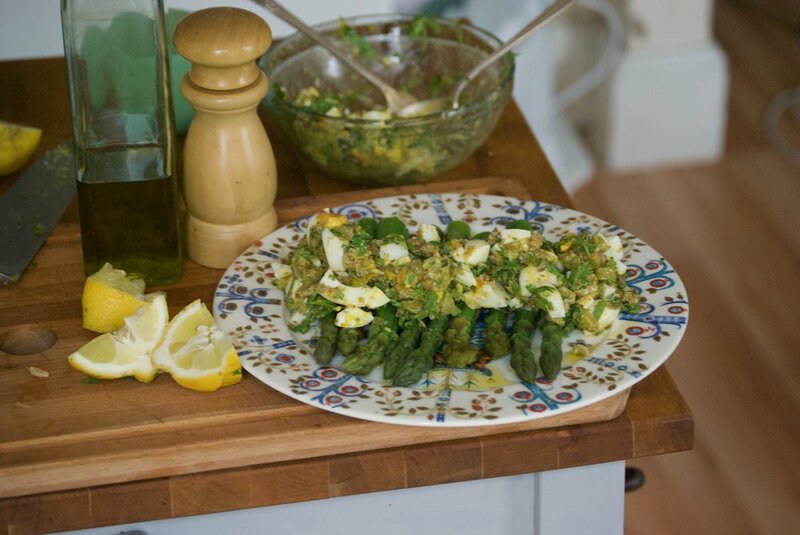 I saw this dish originally in Plenty by ma boy Yotam, but never tried it. 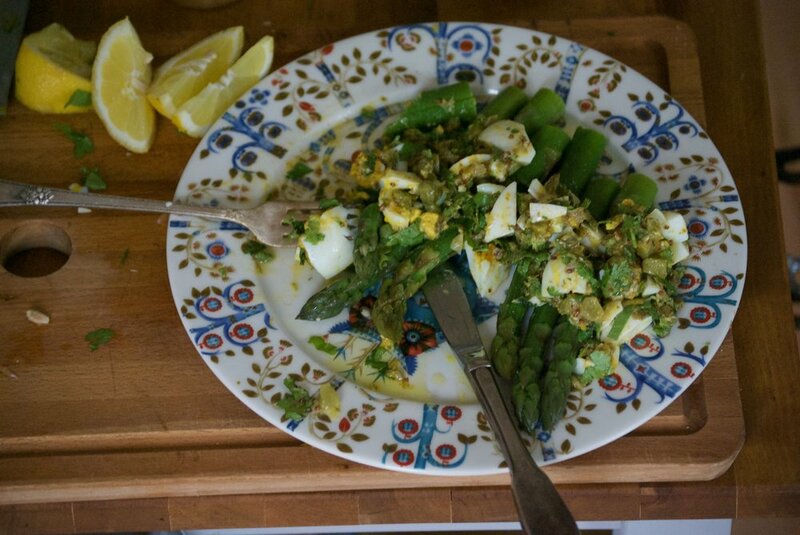 A post on Gribiche dressing by Bon Appetit and a veggie store stuffed with English asparagus pushed me to make it. 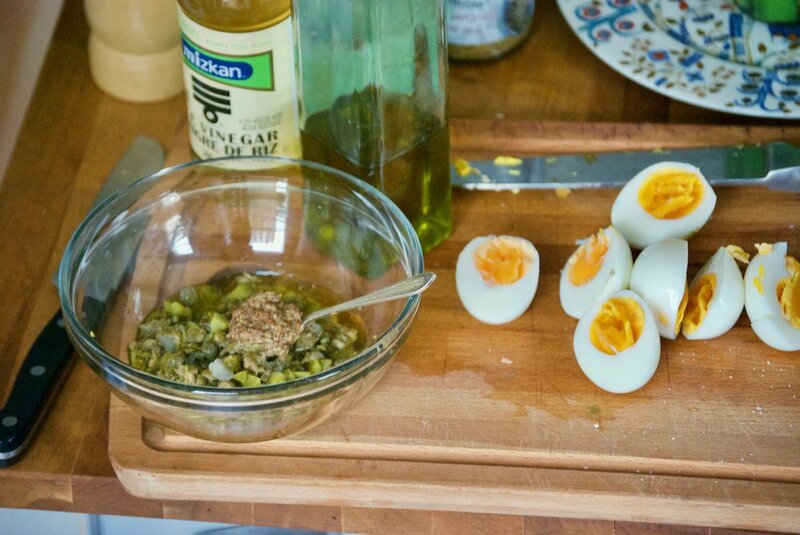 Gribiche is a hard-boiled egg dressing that combined capers, cornichons, and whole mustard. It's a wonderful sauce that would go really well with most vegetables, like grilled zucchini. Add a tablespoon of good mayonnaise and toss with waxy boiled potatoes and you have a wonderful potato salad, or spoon over romaine lettuce and serve with croutons. It's a dressing that begs the useful English slang term "moreish," which means you want more of something. Amazing the creativity of these Brits...but I digress. 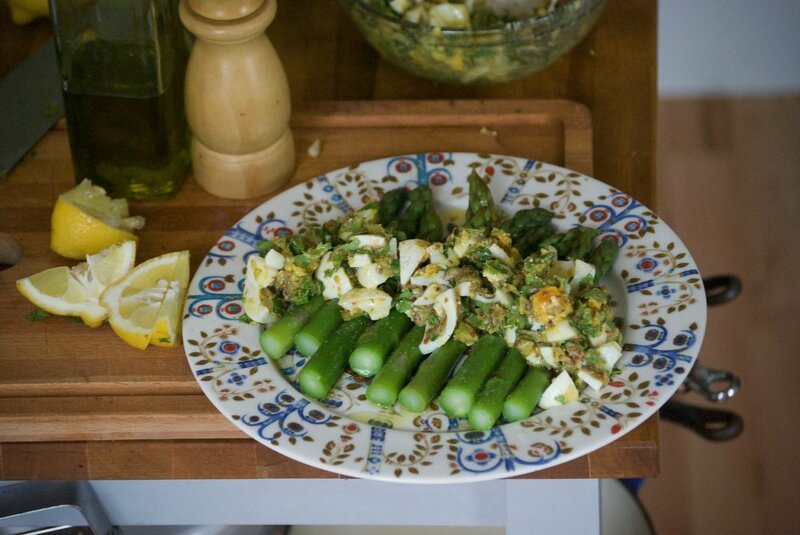 You can't stop eating this and with asparagus, why should you want to? Boil a pot of water and cook the eggs for roughly 10 minutes or until they are hardboiled. Place in cold water and allow to cool. Peel and roughly chop the eggs. 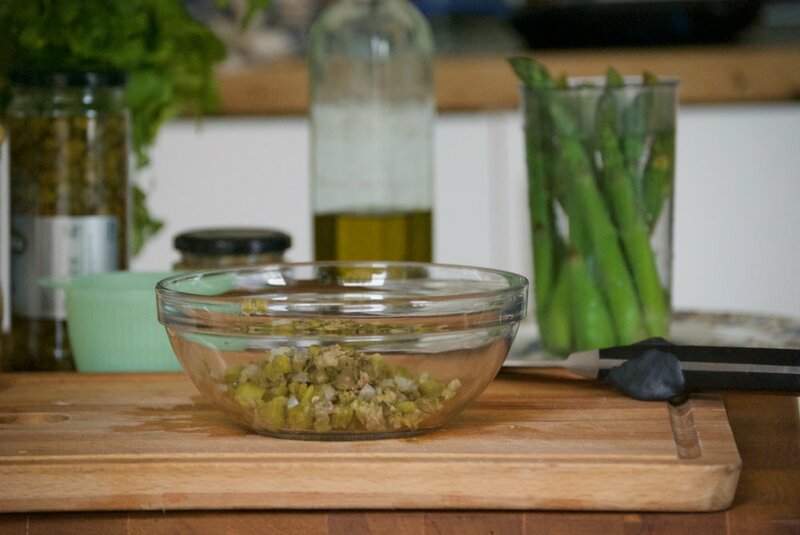 Chop the cornichons and capers and combine in a bowl. Add the oil, vinegar, mustard and salt and pepper to taste and stir. Add the eggs and toss. You can make this up to two days in advance. Bring a large pot of salted water to boil. Drop in the asparagus and cook for 1 minute. 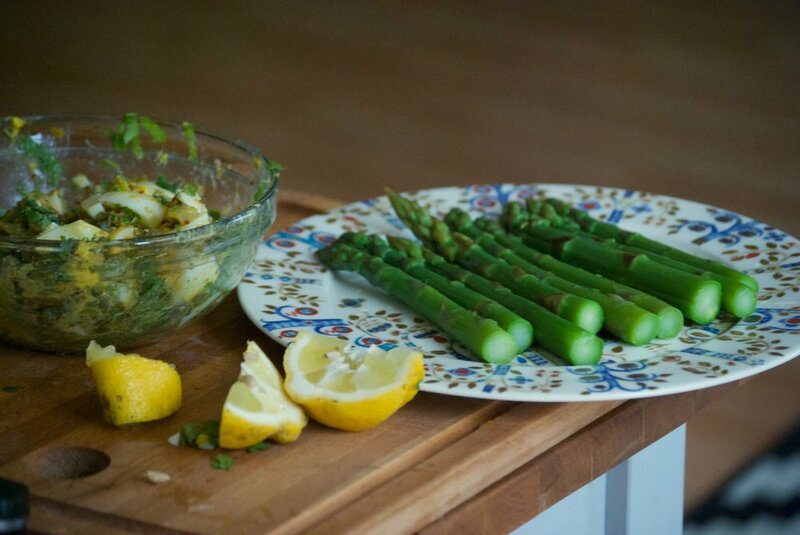 Place the asparagus in a bowl of cold water. Drain and pat dry, and drizzle with lemon juice. Spoon the sauce on top and sprinkle with the chopped parsley. Serve cold or room temperature. Makes an excellent first course, or a side to a beautifully grilled steak.